Athens, Ga. - Since 2007, researchers at the BioEnergy Science Center, one of three Department of Energy-funded research centers, have partnered to figure out how to break down plants so that they easily release the simple sugars that can be processed into biofuels. It's a breakthrough that could make biofuels cost competitive with gasoline. Now, University of Georgia researchers who are part of the team have taken an important step toward that goal by identifying a previously uncharacterized gene that plays a major role in cell wall development of Arabidopsis plants, a discovery that promises to help turn plants into biofuel more efficiently. The team of researchers found that the gene GXMT1 is responsible for directing a key step in the development of the plant polymer xylan, a principal component of cell walls in woody biomass that make it resistant to biofuel conversion. "Our goal is to figure out how the plants make this polymer," said William York, the study's principle investigator and faculty member in the UGA Complex Carbohydrate Research Center. "If we can manipulate that process, we can change how plants make their cell walls, which could make them easier to turn into liquid fuel." As a member of the BioEnergy Science Center, York joins multidisciplinary, multi-institutional research teams pursuing the fundamental scientific breakthroughs needed to make the production of cellulosic biofuels derived from non-food plant fiber cost effective on a national scale. York explained that the problem with many biomass plant candidates is not that they are difficult to grow or harvest, but that they are difficult to process. In order to make biofuels, processing facilities use microbes to ferment the naturally occurring plant sugars into ethanol and other valuable products, much in the same way distilleries make alcoholic beverages. But plants have evolved powerful defenses against the microbes researchers use to break down biomass for fermentation. This research demonstrates that manipulation of biomass structure at the molecular level could yield a crop that is more easily converted into biofuel. "We want to develop strains of plants that are strong and grow well but break down easily when we want them to," said York, who is also a professor of biochemistry and molecular biology in the UGA Franklin College of Arts and Sciences and a member of the UGA Bioenergy Systems Research Institute. In their paper, published in the Proceedings of the National Academy of Sciences, the researchers identified a mutant GXMT1 plant that produces structurally modified xylan that is more easily released when the biomass is treated with hot water. The release of xylan during this treatment will ultimately make it easier for microbes to digest the woody fibers and convert them to ethanol. If researchers can find ways to capitalize on this mutant version of the plant and alter this gene without compromising the structural integrity of the wood, they can begin the process of developing plants specifically designed for biofuel conversion. While the development of efficient biofuels is a major driving force behind their work, this research also contributes significantly to the understanding of basic plant development. 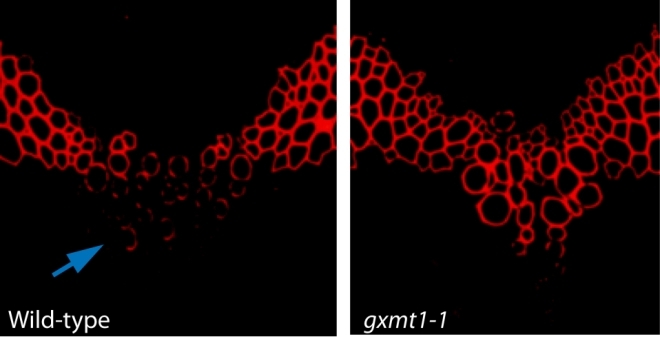 Before their discovery, GXMT1 was categorized in scientific literature as a protein of unknown function, but it is now the first enzyme shown to catalyze the formation of methyl-glucuronic acid, a key structural component of xylan in plant biomass. Ultimately, York and his collaborators hope that their research will open the door to new ways of manipulating plants and making them more useful to humans. "We use plants for everything: We eat plants, we build our homes out of plants, we make all sorts of things with them," York said. "If we can change them, we can make them easier to work with." Other UGA researchers on the study were primary authors Breeanna R. Urbanowicz and Maria J. Pena and co-authors Jason Backe, Malcolm A. O'Neill, Alan G. Darvill, Supriya Ratnaparkhe and Harry J. Gilbert. Collaborators and co-authors from BESC were Hongjia Li and Charles Wyman of the University of California Riverside and Marcus Foston and Arthur J. Ragauskas of the Georgia Institute of Technology. BESC is one of three DOE Bioenergy Research Centers established by the DOE's Office of Science in 2007. The centers support multidisciplinary, multi-institutional research teams pursuing the fundamental scientific breakthroughs needed to make production of cellulosic biofuels, or biofuels from nonfood plant fiber, cost-effective on a national scale. The three centers are coordinated at Oak Ridge National Laboratory, Lawrence Berkeley National Laboratory and the University of Wisconsin-Madison in partnership with Michigan State University.